Its gaze fixed on anti-piracy operations, securing seal lanes and strengthening linkages with countries in the Indian Ocean region (IOR), the Indian Navy is upping the tempo in deployments in the Indian Ocean. Following an advanced exercise involving destroyer INS Mysore, stealth frigates INS Tabar and Tarkash and fleet tanker INS Aditya last month, the UAE Navy conducted a smaller exercise with visiting Indian cadet training ship earlier this week off Port Rashid. Three training ships, INS Tir, INS Sujata and INS Tarangini were in the UAE for the overseas leg of the seamanship and navigation part of sail training. On board INS Tir were over 100 officers fresh out of the Naval Academy in Ezhimala. They will spend six months training to sail warships. 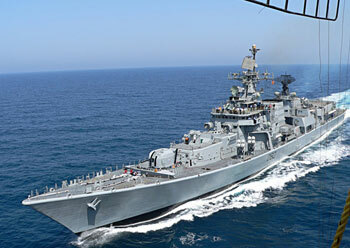 The visit to UAE comes at a time when three frontline surface combatants from the Western fleet - destroyer INS Mumbai, frigates INS Teg and INS Talwar, and fleet tanker INS Deepak - are on deployment to countries in East Africa and the Southern Indian Ocean on a military diplomatic mission. Three of the four ships - INS Mumbai, INS Talwar and INS Deepak docked at Mombasa, Kenya on 15 October and will host a series of bilateral events.